Lock in a great price for NH Collection Villa de Bilbao – rated 8.9 by recent guests! The front staff were very helpful. We had an issue in our room regarding heat (HVAC) and they sent someone right away. The concierge Jon was incredibly helpful and so friendly. The hotel was nice and very clean, well located. Everything was good. The room was very big for us 3. Hello! I regularly stay at the NH Collection Hotels for work and leisure. The front staff were extremely kind and helpful! During our three night stay, we both admitted that we had not had such relaxed nights' sleep in an hotel. The gym was modern, airy, clean and very accommodating. Our accommodation was excellent. We did not eat in the restaurant, either for dinner or breakfast. Staff were very friendly and helpful. NH Collection Villa de Bilbao This rating is a reflection of how the property compares to the industry standard when it comes to price, facilities and services available. It's based on a self-evaluation by the property. Use this rating to help choose your stay! 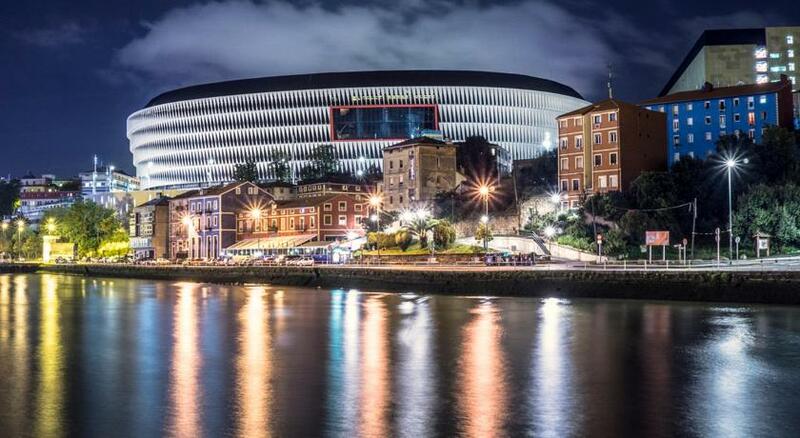 One of our top picks in Bilbao.This modern hotel is in the heart of Bilbao, by the San Mamés Football Stadium and the Euskalduna Palace. It offers free Wi-Fi, and guests can enjoy free access to a fitness center. NH Collection Villa de Bilbao is a short walk from the Guggenheim Museum, Doña Casilda Park and the Fine Arts Museum. 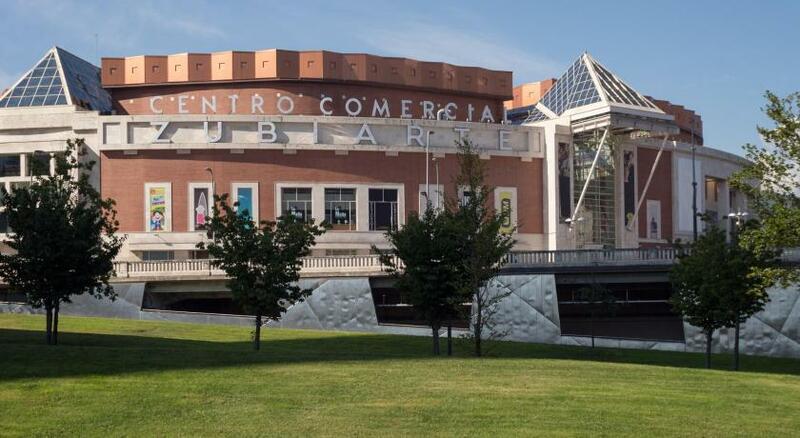 Many tapas bars and shops are found nearby, including the Zubiarte Shopping Center. Rooms at the NH Collection Villa de Bilbao are spacious and well-equipped, with air conditioning and satellite TV. There is underfloor heating and elegant décor, including modern artworks. NH's healthy detox breakfast is served at the Le Bol Blanc restaurant. There is also a lobby bar, where free Wi-Fi is available. NH Collection Villa de Bilbao offers private parking and the airport bus stops nearby. San Mamés Metro Station is 1,300 feet away. When would you like to stay at NH Collection Villa de Bilbao? These spacious rooms are air-conditioned and heated, and come with a 46-inch flat-screen TV with international channels. There is also an espresso machine, a kettle, work desk and safe in the room. In the private bathroom you will find a hairdryer and toiletries. These more spacious rooms offer views of Gran Vía Street. They are air-conditioned and heated, and come with a 46-inch flat-screen TV with international channels. In the private bathroom you will find a hairdryer, bathrobes, slippers and toiletries. The hotel is located in the heart of the city, an easy walk from the Guggenheim Museum and footsteps from the Congress Palace. The building is stylish and modern and was completely renovated in 2012. There are plenty of first-class bars and restaurants on the doorstep, too. House Rules NH Collection Villa de Bilbao takes special requests – add in the next step! NH Collection Villa de Bilbao accepts these cards and reserves the right to temporarily hold an amount prior to arrival. Please note the fitness center opens from 07:00 to 22:00. Great position. Excellent wi-fi. Very friendly staff and spacious rooms. Far away from the old city (40 mins walk) Parking not included and very expensive (25€). Extremely difficult to park in the surrounding areas. Expensive: we got a double room facing a building, poor light and we paid 170€, breakfast not included. Well located, clean, staff very kind. The location. The staff was very kind. Breakfast was very good but very expensive if you don't have a huge appetite. View from the room, but this was not a priority for us anyway. Nice, clean and modern rooms. Very friendly and professional staff. No view from the rooms and getting a little tired decor wise. Good hotel in right location for accessing Metro to get to Exhibition centre. Staff were very helpful and friendly. Good size rooms. Ideal location, friendly and helpful staff. There was hair still on the shower wall. Wasn’t cleaned properly. Lobby area and the business facilities. The breakfast offered various options each of very good quality. The location was good because of the proximity to Bilbao centre. Staff very friendly and helpful with in the hotel and information to get around the city. Air conditioning not working properly, room always very hot (in february). Window view to the hotel interior (room 711) and tv with poor channel selection (almost entirely spanish). Great location next to San Mames stadium (and its metro) and 10 minute walking to Guggenheim. Breakfast with many options, very spacious room, bed and bathroom. A lot of amenities including coffee and teas.